An industrial door is designed for use, but even the best port can be damaged. This usually occurs in case of shock or other external physical injury. Often such damage has a quick fix. 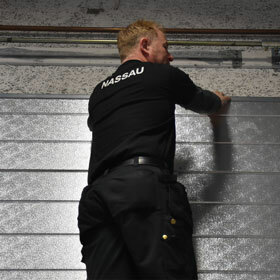 NASSAU has therefore built up an efficient and flexible service department, which can quickly move out, regardless of time of day and geographical location. Of course, we are specialists in the repair of NASSAU ports, but can also correct damage of other brands. We have a large spare-part warehouse, and if that doesn’t work, we have a dedicated service center that handles spare-part orders. NASSAU’s service technician only uses original spare-parts. Contact NASSAU’s service department at service@nassau.dk or call +45 62 62 23 46 if you need original NASSAU service or additional information.